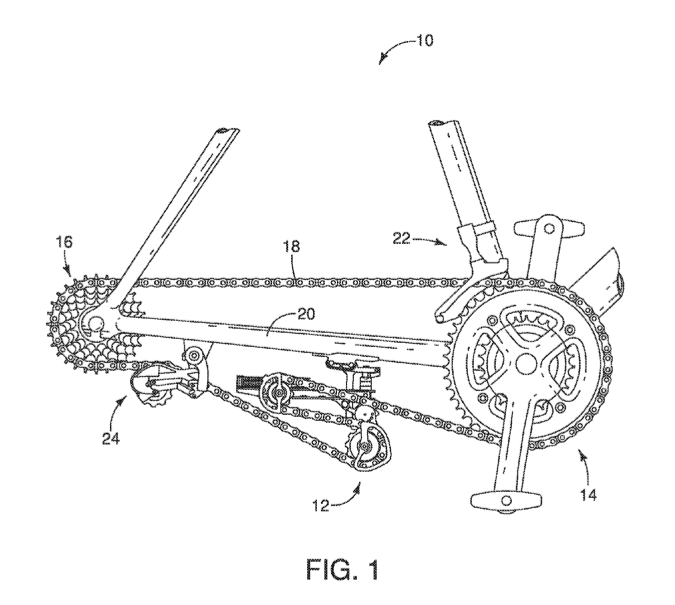 To complement the SRAM narrow-wide chainring post, I was looking for patents by Shimano drawn to their 1x drivetrain chainrings in view this MBR article. I haven’t come across exactly what I’m looking for but I did find some Shimano patents and applications directed to chainstay derailleurs and chain tensioners. I haven’t seen these things on anything new, but Shimano is at least pursuing IP related to them – Shimano responded, on March 12, 2015, to a restriction requirement issued by the USPTO in US 20140357437. Furthermore, the location of the tension device 250 at about mid-way between the gear changing device 232 and the front sprocket of the bicycle ensures that the expanse of unsupported drive chain 218  is minimized, as compared to other designs . The above factors beneficially reduce the flopping movement  of the chain 218 during the impact and absorption of the impact force, as compared to other designs. In addition to the above benefits, the rear derailleur device 230 of the embodiment of the present invention allows for a reduction in the size and weight of the device adjacent the rear sprocket 216. For example, note that the gear changing device 232 is smaller in size and weight than the rear derailleur 330 in FIG. 6A. Additionally, the rear derailleur device 230 of the embodiment of the present invention reduces or prevents entanglement of the drive chain with the gear changing device 232 when the tension device 250 pivots due to impact. I admit that I’ve been fortunate to never have a derailleur go into my rear wheel, but I’ve seen it and the frustration it’s caused. Could the chainstay derailleur and chain tensioner be the solution? Related Patents/Applications: Continuation in Part of US 13/910,043, under non-final rejection and published as US 2014-0357436.